Say goodbye to rough, dry skin and say hello to glow. Glow Shangoe Salt Scrub is a luxuriously smooth exfoliating body scrub loaded with skin nourishing ingredients. 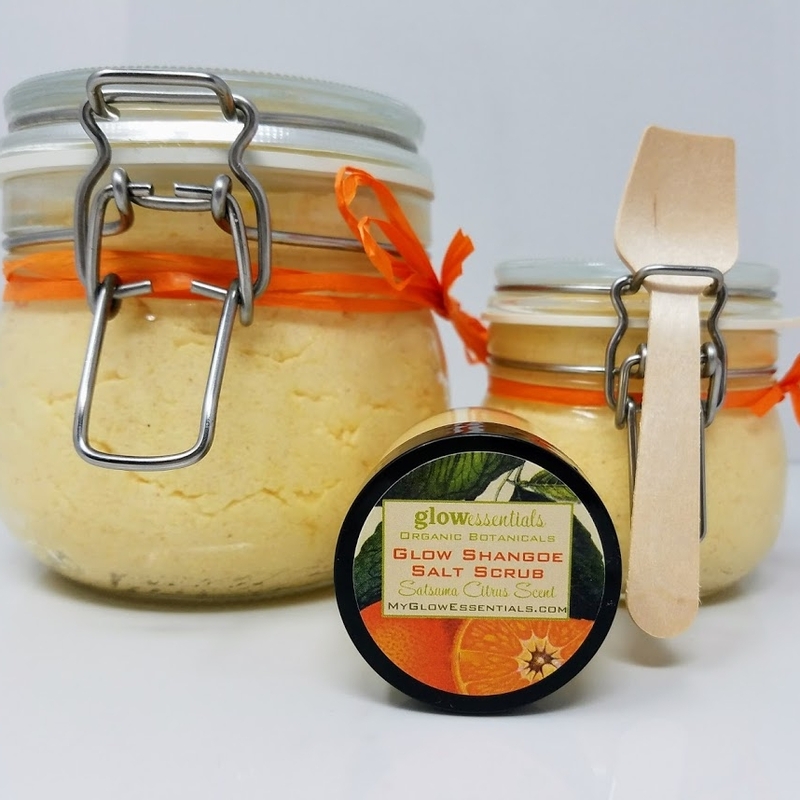 Glow Shangoe Salt Scrub is an exfoliating body scrub and hydrating moisturizer all in one. Glow Shangoe is a blend of Organic SHea, MANGo & AlOE (SH-ANG-OE) Butters, blended with 10 skin nourishing oils and then combined with ultra fine pink Himalayan salt & Mediterranean Sea salt. Rich in over 80 minerals, the ultra fine texture of this luxurious scrub is perfect for exfoliation, leaving your skin hydrated for days. With a refreshing Satsuma Citrus scent, this will have your skin looking and feeling radiant and smooth in no time. This product is also available in our Refresh & Glow Shangoe Duo as a special value set. So, say goodbye to rough, dry skin and say hello to glow. Mango Butter is pressed from the large seeds of the mango fruit. This highly saturated butter contains many nutritive qualities. It is used traditionally for wound healing and skin repair because it contains a high amount of stable Vitamin C, as well as powerful antioxidants and a combination of skin nourishing fatty acids. It is also known to be revitalizing and rejuvenating to the layers of the skin, and it contains UV protective capabilities. On the skin, it has a light, satiny feel. Mandarin Oil is an essential oil. We use both red and green mandarin oils, blended with other premium essential oils to give Glow Shangoe a beautifully refreshing Satsuma Citrus scent. Mandarin oil is produced by cold expressing the volatile oils from the mandarin fruit at various stages of ripeness. It is a fantastic oil for skin care, specifically used to combat cellulite, however it is also used aromatherapeutically to help dispel nervous tension, irritability and exhaustion. For body, hands and feet exfoliation & hydration, use 3-4 times weekly. Apply a generous amount and lightly scrub in a circular motion to slough off dull, dry skin. Avoid using on areas of broken skin or mucous membranes. Rinse in warm water to remove salt and leave skin glowing & refreshed.